If you’ve only just started grad school, or if you’re getting ready to finish, there are a ton of great reasons to take the OTS course this summer. The Organization for Tropical Studies courses aren’t just for tropical biologists, and the experience is useful for all ecology grad students. Breadth of research methods — Gain experience in running experiments in a great variety of biomes, fields, and taxa. No matter your speciality, it can be useful and important to know how to mark insects, do biogeochemistry and microbial ecology, dissect flowers and do pollination experiments, mist net birds and bats, make and analyze sound recordings, and much, much more. Making connections — You will work very closely with a large number of faculty from universities all over the United States and elsewhere. More important, you’re in the course with a bunch of other grad students who are typically fun-loving and academically talented. The course is work hard-play hard environment and you’ll go back home with new friends and colleagues, some of whom you’ll stay in touch with for the remainder of your career. You want to emerge from grad school with a network that goes well beyond your own institution. This is a great way to make that happen. Experimental design — This course will have you designing and conducting experiments at many different sites in small groups. This really helps you learn how to develop the right questions, design the most appropriate experiments and that you’ve had the best analysis in mind the whole time. Data analysis — Because you are involved in so many experiments, you gain experience with may kinds of analysis. The course has expert faculty including well-recognized statistical gurus who communicate in common English. You’ll get training in R to give you the tools that you need. Science communication skills — Learn how to produce media that communicate your science with the public, by working with PhD scientists/filmmakers. Here are the tremendous results from a brief science communication project on the OTS course, from a post on the National Geographic Explorers Journal. The course runs its own blog and you have an opportunity to create podcasts and posts. Experience with conservation in action — You’ll have the chance to interact with land managers and conservation professionals on the sites of ongoing projects. If you’re thinking about getting into the this aspect of the ecology business, you’ll have experiences and opportunities with making connections. Tropical nature — If you haven’t ever spent time in the tropics, the biological diversity is stunning compared to the meager biota of the temperate zone. You get to see these biomes in the company of researchers who are experts in this environment and conduct a number of experiments. If you want to learn natural history and biodiversity, this is a chance to be in the field with the experts who can show you what you what to learn. Units — You get six credit hours from the University of Costa Rica that (typically) count towards the coursework requirements of your program. So, there’s that, too. Speaking just from my own experience, the course gave me so many skills — and ideas — that have been useful in many unpredictable ways. I’ve yet to meet anybody who has taken the course who has said it is anything short of incredibly useful, and I think everybody has rated it as a spectacular experience. In the course of your graduate career, it definitely is worth your time. Here’s a pdf flyer with more info. Here is the link to the course for summer 2014, with its list of great faculty and remarkable sites the course visits, and instructions on how to apply. The deadline for applications is just over a week away, but then there are rolling admissions afterwards. This entry was tagged Costa Rica, field courses, grad school, grad students, international travel, research strategies, statistics, travel. 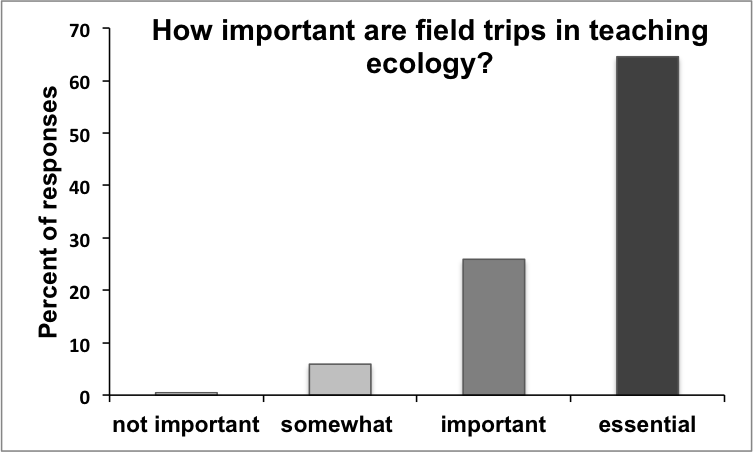 As an antidote to last weeks challenges to teaching ecology, here I’ve collected all the responses to the question: What teaching tools do you find most effective in ecology courses? As before, text in italics is quoted from responses. It was somewhat heartening to me that the most common effective teaching tool used by ecologists is the outdoors. Field trips were mentioned 55 times as the best way to teach ecology and they are also frequently used in courses. Now I know that all ecology isn’t field-based but getting outside seems to be a good way to inspire students and getting them thinking about the world around them in a different way. On this general theme, laboratory exercises and hands-on-activities were also frequently mentioned. There were also a couple mentions of using videos as an effective teaching tool and if you are thinking about incorporating videos into your classroom you should stop right now and head over to Dynamic Ecology. There you will find an amazing list complied by Meg Duffy of all sorts of ecology/evolution videos handily categorized by subject. Videos can be also be a way of “getting outside” in courses where this is tough to do by giving real world examples of ecological phenomena. A second theme to emerge was “active learning” techniques. Active learning basically refers to any technique that involves a more student-centered approach than straight lectures. In part, the involvement of labs and field exercises for ecology courses and the importance that most place on these activities already adds active learning to an ecology course. However, there was this little gem of a comment to remind us that our job as teachers is to create an integrated course with a purpose to the various activities: Making sure lecture and lab are well integrated. But it also seems that ecologists are finding it useful to break-up or replace lectures with active learning activities like clicker questions, think-pair-share, and the like. 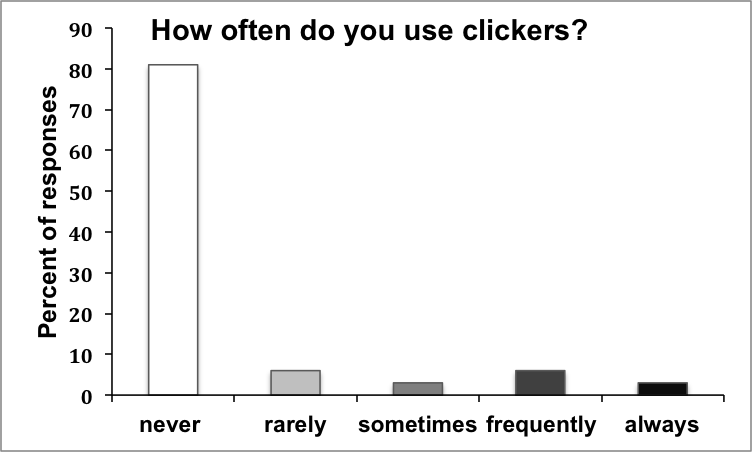 Clickers—some love them, some do not and it seems that most ecologists do not use them. Meg Duffy also has a pair of posts on why she uses clickers in her courses (Part 1 and Part 2) with some links to pedagogy behind them (found in part 1). As you can see below, Meg is quite the maverick in the field (only 12% use clickers sometimes to always) but there is a growing acknowledgment that these kinds of teaching tools can be highly effective for teaching (e.g. this article in Science is behind a paywall but you can listen to the podcast for free). And here’s a glowing account of clickers in science classrooms. Another suggested TopHat, which is a platform where you can use cellphones, computers or tablets instead of buying a particular clicker system. But, of course, it is important to remember that it is all about the questions you ask using clickers and that to be effective these need to be thoughtful. Unfortunately, we are at the stage where most of us aren’t using clickers, so there is not a resource of questions that you can modify for your course. I also want to share this anecdote of one person’s experiment with how to change up a lecture. It highlights some of the pluses of engaging students during lecture time—it can be more fun, tell you about where the student’s understanding is at and demonstrate to the students what they do and do not know. As the author suggests, there are probably many ways that this kind of engagement can be involved but the game show style seemed like a fun idea. I find that it’s easy for students to sit in lecture and think they understand a concept without knowing that they don’t really get it. This year I started having 3 students at a time come up to the board and I’d ask them a question (e.g. draw a graph of productivity and how it would be influenced by different levels of disturbance). They could get help from their “fans” behind them (1 student from the left, 1 center and 1 right were chosen so their audience behind them was their fan base) so there wasn’t so much pressure on the selected students up front. It was actually a great way for me to find out what they knew. For instance, the first time I did it I learned that nobody in the class knew how to draw standard error bars… If I had just drawn it, I think they’d all just nod and think “oh yeah, I knew that” but when they were pressured to stand up and do it themselves, even with help from the fans, nobody could do it. It showed me that I had a different expectation of what they knew than what they did know (I just assumed everyone in their Junior year of college would know how to draw standard errors). Later in the class I asked them a density dependent question and they all got it in under 10 seconds – I was so surprised! I thought that one would stump them. I think the same thing can be done with clickers, I just haven’t taken the time to figure out how to get clickers to work in my class (and frankly the game-show environment of the 3 contestants up front is sort of a fun way to break up the monotony of a lecture. In direct contrast, there was the following comment: I have tried lots of alternative techniques but students like straight lecture the best. I think there is a real issue here; whatever the teaching tool or technique you use, you need to make it work for you. We are all different in our teaching styles and there is no one solution fits all. And not to pick on this one commenter, there are a number of potential reasons for this problem. It might be that the teacher likes to lecture best and therefore puts more effort into that activity, stacking the cards for lecturing. Or it might be that they never got training on how to make the alternative techniques they’ve tried effective. Whatever the reason, this comment also made me ponder whether we should care what students like best. Of course it is nice (and sometimes very important) to get back good student evaluations of your teaching and course. However, if we are in the business of teaching and care about it, than we should be more concerned with whether students learn than how much they liked how they were taught. Discussions can be a useful way to get students thinking about the material and gaging how well it is understood. Think-pair-share is a basic technique where students first think about a question, then discuss with their partner/neighbour and then the results of these discussions are shared with the class. I suspect even the person who commented that they didn’t know what this was, has some idea of it in practice. But even general class discussions were frequently mentioned as useful to teaching ecology. Flipped classes are an approach where students learn content at home (via video lectures, reading, etc) and do “homework” in the classroom. Class time is then used to interact with the instructor and fellow students, rather than passively listen to lectures. One person answered by saying that they wanted to do this more and it is what I imagine you’d see in Terry’s classes. I plan to do some more of this next spring for my Ecological Methods course. I have been slowly shifting from the lectures that were given in the past in this course to more active techniques, in part because lectures on things like quadrat size and shape tend to be dry for both the students and me. Ecology is a science, and many suggested that the best way for students to learn is by doing. Everything from reading primary literature to designing experiments to writing proposals to conducting studies/experiments to analyzing data to presenting findings, basically teachable versions of what ‘real’ ecologists do was suggested as a useful way to teach ecology. I hope that every student walks away from their ecology courses at least knowing how scientists study ecology. Finally, a number of people suggested particular tools or sites that they find useful. TIEE, Teaching Issues and Experiments in Ecology, was brought up twice as an effective teaching tool and I can personally second the use. Last year, I revamped the diversity section of the course I am involved with teaching (Ecological Methods). Instead of using a made-up dataset that had been used in previous years, I tried the lab on diversity in tall grass prairie. Students really appreciated being able to relate the diversity estimates to real data and I think it was a useful way to approach the subject before they collected their own data. Simulations of ecological processes are an alternative to running labs and field exercises. SimUText got this this endorsement “Love it!” and the associated EcoBeaker was also recommended. Judging from the answers to the question: “What tools would you like to be more available for use in teaching ecology?” cheap affective computer simulations are one of the top requests. Clearly there is a desire to use these tools, especially as resources for courses diminish and lab/field components seem to be under increasing pressure. Although directed at high school students, one person suggested this site for good activities for non-majors. When I was a TA for a biology major required evolution course, we also used the activity for demonstrating natural selection. So in some contexts these might also work for entry-level majors courses. And then there was this: chalk (seriously). There is definitely something to be said for writing things out for students to follow your process. This is a class I would like to attend: I prepare 2-5 slides/lecture about news stories or papers I’ve read since the last lecture that are relevant to the course, to make the point with the students that what they’re learning has relevance to the rest of their lives, and that my goal is to make them educated voters, citizens, taxpayers. A high goal but one I certainly hope that we can achieve through our teaching. Next week: How do ecologists teach and are there barriers to change? This entry was tagged efficient teaching, field courses, teaching, undergraduates. 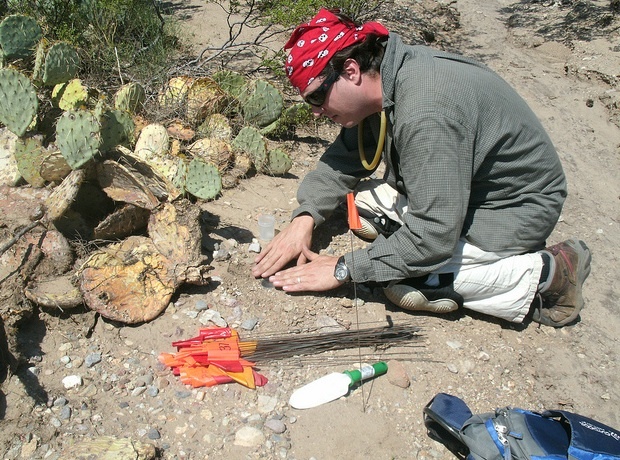 Field courses are critical for the development of scientists in a variety of disciplines. This fact is self-evident to many. For those whom it is not, then Chris Buddle has already written a great post explaining exactly why field courses matter. He also has some top-notch specific tips on how to run your field lab. In this post, I’m not talking about an outdoor lab section during the semester. I’m thinking of a course that is based somewhere away from the university, in a field location apart from a university. These are immersive experiences, that don’t last a whole semester, but include a semester’s worth of work in a shorter period of time. They are taught in a way similar to how courses in the block system are taught. At many universities lacking a strong tradition of field courses, students don’t get enough academic credit for their field courses, and faculty don’t get enough credit to teach these courses. This creates a disincentive for faculty to offer such courses and for students to enroll in them. This isn’t the only reason field courses have experienced atrophy, but I think it’s a big piece. Field courses are often undervalued relative to traditional courses taught within the university. This undervaluation reflects not just the funds allocated towards operating the courses, but also the work of the students and faculty. After chatting with some colleagues at an international field station, I’ve discovered that some of the faculty teaching field courses are working out of generosity, because they’re being undercompensated. Moreover, the students on field courses are participating even though they’re not earning the academic credit that should be associated with their effort on the course. I’ve discovered more often, though, that faculty aren’t teaching field courses because it’s not worth their time, the way that their universities account for their time. I do realize – and have witnessed – that some field courses could actually be light on academics and hard work, and could amount to a vacation for all people involved. (Taking an undergraduate course traveling throughout Costa Rica is definitely not my kind of vacation.) For a course to receive appropriate credit, it’s only reasonable for there to be some degree of accountability so that everyone involved knows the hours of specific directed academic work that were conducted by the students on the course. However, this entirely point is a red herring because the potential for a no-work vacation-like aspect of courses is independent of the field. Lots of on-campus labs and lecture courses lack rigor, perhaps more often than field courses. Here’s my relevant anecdote: Just weeks into my first tenure-track position, I put together a new course proposal that I brought to a departmental meeting. The proposal was well-vetted and approved by my chair, who was a lab-oriented scientist. The proposal was for a standard field course in Tropical Biology, in a few sites in Costa Rica, during the university’s January break. The proposal was straightforward, without any hitches, resembled excellent courses with which I was familiar, and followed standard practices. Running an entire class as a field course, with a few pre-departure sessions, was a novelty in my department at the time. The department thought the course was great. However, they wanted it to be offered as a three-unit course, not as a four-unit course, as I had proposed. I looked at how much time was being spent on the course, how much work was scheduled for the students. I also looked at university guidelines for the hours of instruction and lab activity are supposed to be associated with units. My proposed four units was a lowball, because the amount of class time and field activities with the course far exceeded a typical 4-unit course, even if the time frame was relatively short. This notion didn’t sway my department from the request that the proposed course run at three units. They asked, what’s my priority? Teaching or research? Do you have a problem with spending all of winter break teaching a four unit course? I thought to myself, I do have a problem if it’s far more than four units worth of work for myself and for the students. Essentially, my department rejected my argument, not with any specific rebuttal about the value of units or how much work or time was spent on the course. They just didn’t like the idea that students could earn four units over such a short period of time. I think they didn’t realize how much I’d be working the butts off of these students on the course. They didn’t think I’d be running a field course with twelve solid hours of work per day. I’ve seen such courses, and in my view they’re the most successful ones. Instead, I resolved to make as many field opportunities as possible for research students. To date, I have yet to teach my own field course in the tropics, though I often have a very minor role in other courses offered through other institutions. And I am now an instructor on a field course operated by a field station. I thought my experience in getting mildly shafted on the units was rather unique, but then I was chatting with a variety of people and realized that this limited-units situation might be the norm rather than the outlier. One of my field station buddies just finished teaching a demanding field course this summer. The students just went home. I asked her if the summer course counted towards her academic year teaching load. She said it did, that the field course counted for half of a regular lecture course. I saw her course in action. They were traveling around for multiple weeks, and working in earnest 12 hours per day, if not more. Even if you run the numbers so that all activities are considered as a “lab” rather than a “lecture,” then it’s obvious to everyone that the students should be earning a full lecture course credit for the experience, and also that the instructor receives full credit for a teaching a full course. Clearly, from where I sit, this course was far more work, cumulatively, than any normal lecture course during a regular semester. Yet she only got a half-course credit. She said that she was turned down for full credit for the course, and she taught it anyway. Her circumstance was similar to my own, but the difference is that her students benefited from her decision to sacrifice herself. I told her I was surprised that she decided to do it. (We’ve never had problems sharing our unsolicited opinions with one another.) If I were in her shoes, I wouldn’t be teaching it again unless everybody involved got appropriate credit. She had wonderful reasons for teaching the course. She provided amazing opportunities to a group of students that she likes and at her university. If she didn’t do it, those opportunities wouldn’t exist. If our job is to inspire and change the lives of our students, then her field course epitomizes her success as a teacher, from what I saw. I also saw how much time she had put into the experience: far more than any normal course, and for half of the credit. That’s not only unfair, it’s also unsustainable. I can’t imagine anybody sensible person doing a more than a full course’s worth of work for the credit of a half-course on a regular basis. Why do these field courses not get enough credit from universities? This might be overly simplistic, but I suspect it’s because most faculty – who don’t teach these courses and probably have never taken one – don’t understand them. Perhaps we could invite them along to join one of these courses for a few days and then evaluate if they’re worth the credit. If they’re not willing to invest their own time into sizing it up, then they should be willing to abandon their objections. 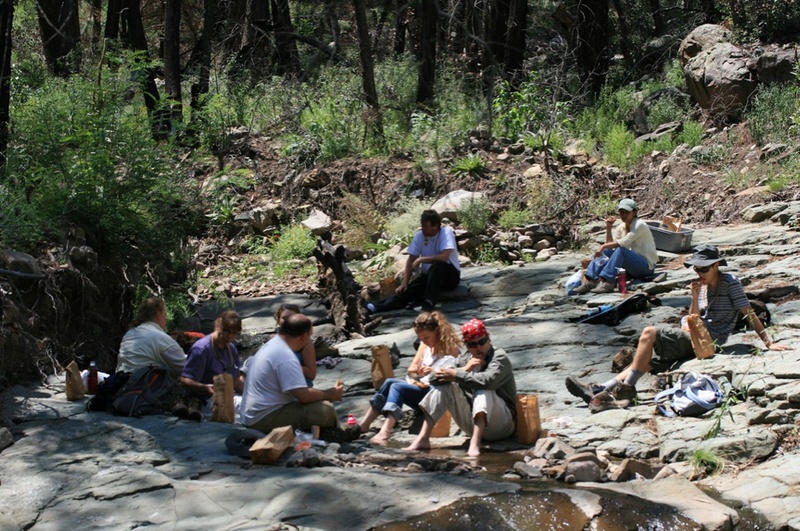 The understanding of these field courses is inherently experiential. I don’t know whether, from campus to campus, the problem is more often at the level of the department, the college, or the dreaded and dreadful curriculum committee. Perhaps if students finishing up a course wrote a summary of exactly what they did, and what they learned, and how it fit into the calendar, it would make a difference. In theory, the numbers should be the numbers. But at some places, the number of hours in lecture and the lab (or field) aren’t enough to satisfy critics, who might find other reasons to oppose full credit, with the tacit bias that fieldwork isn’t as valuable as labwork. Have any of you helped gain adequate credit for a field course in a system that had undervalued them? Does your university offer strong field courses, and if so, are they accompanied with a robust credit structure for students and faculty? Tips o’ the hat to Alex Bond, Chris Buddle, and Cat Cardelus for digital or corporeal conversations on the topic. This entry was tagged field courses, teaching, time management.